This is a nice clean wood handle slot bit ratchet screwdriver marked "YANKEE NO. 2H HANDY MAN MADE IN U.S.A. PAT. 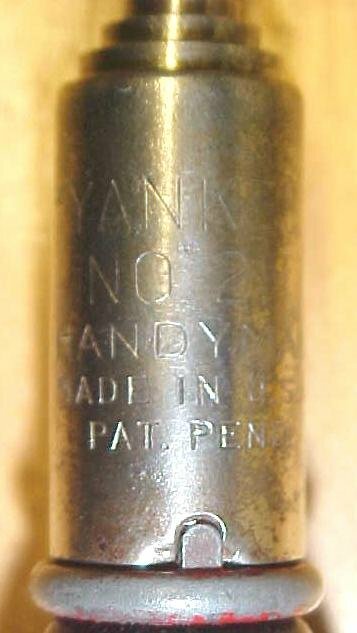 PENDING", and also marked "YANKEE HANDYMAN" on the painted wood handle. It was made by North Brothers Mfg. Co. in the late 1930's as the patent pending marked generally refers to product manufactured during the begining of manufacturing before the actual patent was granted on the product. This is one of very few I have seen with the Pat. Pending mark on it. North Brothers made these from 1939 to 1947 when Stanley purchased North Brothers Mfg. Co.. This one has the black painted handle (they were made by North Bros. in either black or white) with most of the paint intact, with a few dings on the handle noted. The ratchet works in clockwise and counter-clockwise motion, via a control switch on the main steel shaft. This one is 4" long overall, and has a .15" width tip at the end, in very good condition with very little wear. Works and looks good! Items Similar To "Yankee Handyman No. 2H Ratchet Screwdriver"